This article gives 10 reasons why it is beneficial to use ipads in the classroom. Including computers in a classroom is not a novel idea but what about iPads? Read this article to understand the 10 reasons classrooms should have iPads. There's a plethora of ways to use your iPad in the classroom but this infographic details some insanely useful apps, methods, and ideas for all teachers. I loved this article about how a teacher got a grant for an ipad which she used in her special education classroom. A student "who had never written a word before, wrote his first word on the ipad. Three students utilized the ipad's stimulating and interactive features and finally learned to read at the ages of 12,13, and 14 years of age." It was awesome to read about how this piece of technology changed how these students learned and how they were able to overcome learning limitations. The ipad mad them progress in ways that they never thought was possible. Teacher Neil Virani was fed up with the sad reality special education students faced and began to change his student’s lives with technology. In this article, they give some great ideas of apps that you can use on the Ipad in a Special Education classroom. They separate the apps by disability or disorder; so they have certain apps for communication disorders, behavior, and motor skill development. As a future special education teacher, this article was very helpful and especially when they separated the apps by disability. A young man takes you through how he uses the ipad to help him learn. Its awesome to see how a person who has a disability can use the ipad to help them do things they otherwise could do! This video takes you through a school that has many students with special needs who are nonverbal. With the help of the Ipad and a software called Proloquo2go, the students are able to finally communicate with their teachers. The teachers are also able to know what their students want by using this program to communicate. Students at the University of Notre Dame who decided to ditch their textbooks and instead use e-reader on the Ipad said that they learned more from their classes and enjoyed them more. The students said, "the Ipad encouraged them to explore additional course topics, increased their learning, and made the course more interesting." They also loved how portable and light weight the Ipad was! This video goes through everything Ipad! He tells you how affordable they are, how students can use the ipad, and how as a teacher you can use the Ipad in the classroom. He talks about using it as a textbook and how it saves money. Its a great video if you need help deciding if you want to get an Ipad or not. This article is a really cool tool because it shows you lots of cool features and shortcuts that you can do with the Ipad. It shows you everything you would want to know, from how to use the ipad in general to securing it, to even finding your friends. It was really neat to see all the things the Ipad can do, and a lot of it I had never even seen before: like how you can split the keyboard or use Phantom Buttons! We all want to get the very best out of our devices! Who doesn't love finding out a new trick or shortcut? 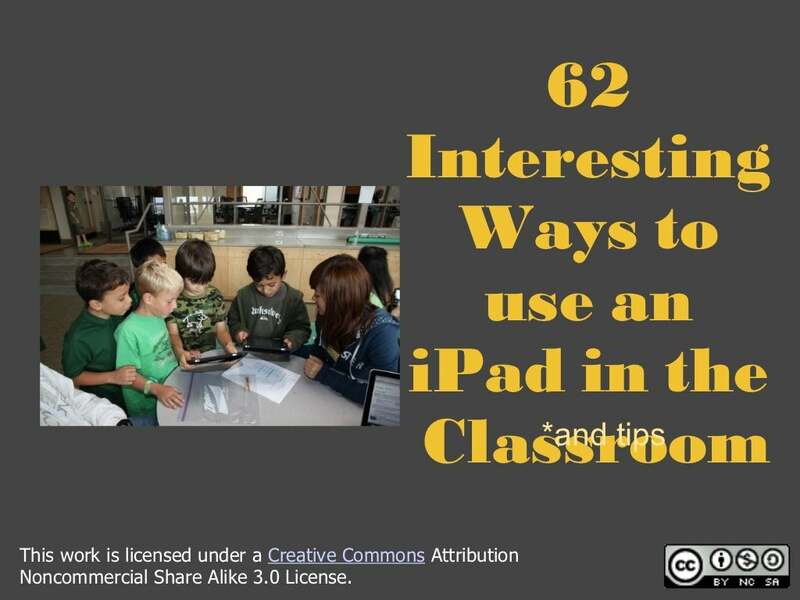 This article is really great because it gives you so many different ways to use the Ipad in the classroom for various grades! From Reading out loud and share to practice letter formatting, to even creating music. There are so many things that I never thought one could do with the Ipad! The ideas and options are endless!